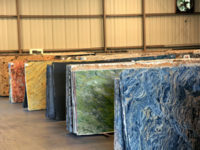 Reputable fabricators are very cautious when it comes to the quality of slabs they get from suppliers. While it is perfectly normal and acceptable for slabs to be resined to resolve simple, common problems, it is certainly not acceptable for resining to be used as a way of making a fundamentally bad slab appear to be a quality one. Highly trained and experienced fabricators will recognize the difference and refuse to purchase doctored slabs.